Stepfamilies are becoming the most common type of families in America. There are many issues that come with living in a stepfamily.As a stepmom, the job is much more complex than I imagined.I want to be able to influence my children and stepdaughter in a godly way. Being a stepmom is a difficult role at times. 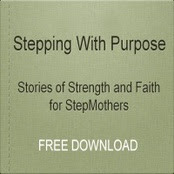 Here are some things to remember as you go along your stepmom journey that may help. Don't expect everyone to be happy all the time. Learn to let go of things that you can't control. Learn about normal stepfamily issues so you can make sense of circumstances that you are going through. stepmoms need to be flexible when possible. Stepmoms need to accept that being a stepmom is unfair and lonely at times. Stepmoms need to know that she may not see the fruits of her sacrifices until the children become adults. this process takes time and patience and alot of PRAYER.Know that you will never become the real mom to your stepchild.It's OK -don't go nuts trying to. In closing , learn to be warm ,trusting and available to your stepchildren, then hopefully your relationship will slowly grow for you and your stepchildren.I continue to pray for GOD to show me how to be the kind of stepmom he wants me to be.